2.bt705 does not only read clear engine system faults, it also shows live vehicle sensors data and freeze frame data. 3.Multilingual menu options and code definitions for an international marketplace. It supports English, French, German, Spanish and more. 4.With upate tool Foxlink, you will always have the latest bug fixed and newly added parameters and they are life-time free. 5.Two key operationand menu-driven navigation make it extremely easy to use. Ruggedly built and compact design. 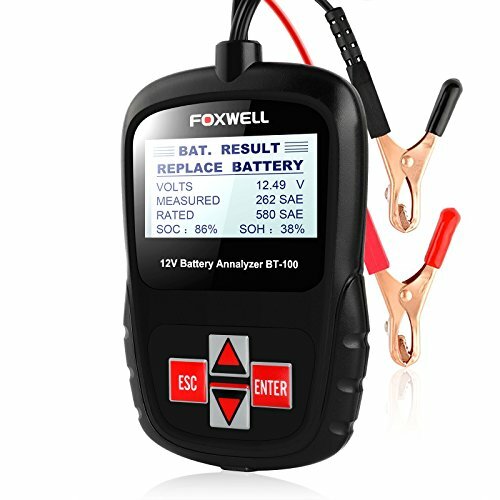 ▶A MUST FOR CAR-OWNERS◀ This battery analyzer offers you a way to analyze the battery health status, view battery charging status and detect faults without stepping out and paying too much. ▶BASIC FUNCTIONS◀ Allows you to check battery condition of 6V/12V 100-1100 CCA regular flooded, AGM flat plate, AGM spiral and GEL batteries, and gives you a quick and accurate test result in 3 seconds. ▶EASY TO USE◀ Large backlit LCD display, clear arranged keypad and menu-driven operation make the battery load tester much easier to operate, and powers itself off the battery, especially born for beginners. ▶SAFE AND RELIABLE QUALITY◀ This battery tester doesn't emit light, heat or spark, won't discharge battery. It also has polarities wrongly-connected protection and over-voltage protection. ▶HIGH-QUALITY SERVICE◀ We're trying our best to offer you best products and services. Response in time, refund allowed and one-year warranty. If you have any questions about this product by FOXWELL, contact us by completing and submitting the form below. If you are looking for a specif part number, please include it with your message.